About: Located within easy reach of Berwick Street Market, The Endurance is a pub that not only serves beers, wines and spirits - but also an array of fish and game dishes. Adorned with wooden tables and leather banqueting style seats, it emanates a Victorian feel whilst combining a range of complimentary features. They also have a jukebox as additional entertainment and can cater for private parties upon request. Please call for further details. 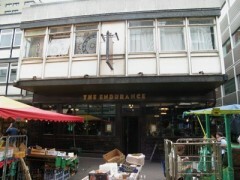 Frequented by a mixture of hipsters, media darlings and market traders, The Endurance is a lot of fun. It has always been in possession of a good jukebox but only recently has it expanded its food menu into something worth visiting for. William Morris style prints on the walls, dark wooden furniture and leather benches add a touch of ye olde glamour to the place.